The Moveable Feast series came to a close April 2 with a fusion of painting and music. Art lovers came to the Fine Arts Auditorium to see the presentation The a Emergence of Modernism: Art Between the Wars. The presentation included a talk by Dr. Deborah Jamieson on the various styles of modern painting, and musical performances by Dr. Steve Primatic, Dr. Benjamin Warsaw and Dr. Emily Grundstad-Hall. The event began with Dr. Jamieson discussing the social changes in mid-19th century Paris. This is when modern art started to form. Old neighborhoods were demolished and new structures were built to turn Paris into a modern city. The changes made the city more accessible. People left the country and headed for the city. The population in Paris swelled as people adjusted to a more industrial lifestyle. Modern artists wanted to depict this new life in their paintings. They used techniques that had never been used before. The Impressionist, for example, used quick brushstrokes to paint Parisians at leisure. Their paintings usually have bright colors and a soft, blurry look. After Dr. Jamieson finished talking about Impressionism, Dr. Warsaw and Dr. Grundstad- Hall performed music from the era while some paintings by Claude Monet were shown in the background. The years between World War I and World War II are called The Age of Isms because several radical yet intellectual styles developed. Each style had its own manifesto. Many people questioned traditional societal values just before and after WWI and the art of the time reflected that change. 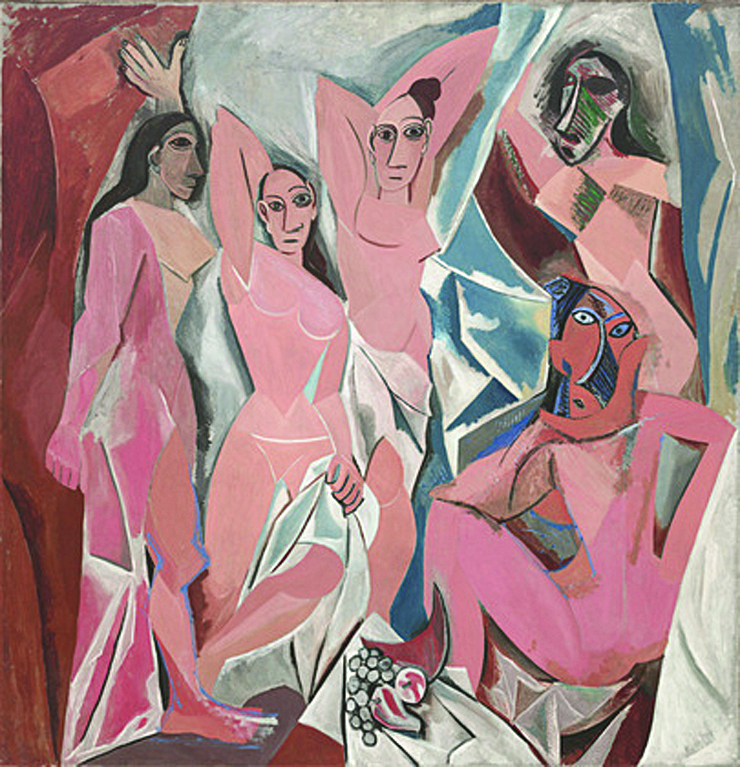 Pablo Picasso’s Les Demoiselles d’Avignon is considered one of the most radical pieces of the both the time. The flat shapes, jagged angles and tribal mask-like faces of the women in the painting shocked the art world. Even his close friend painter Georges Braque was jarred by the piece. Other movements were forming in painting during this time, led by artists like Wassily Kandinsky who led a movement called Der Blaue Reiter (The Blue Rider). Kandinsky believed that painting was closely linked to music. He wrote Concerning the Spiritual in Art in 1910 to encourage painters to “compose” paintings with color. For him, color was a keyboard, the eyes were the hammers of a piano, the soul was a piano with many strings and the artist was the piano player. Kandinsky continued to compare painting to music with the idea of atonality. Atonal music has no center note or key. Kandinsky believed that subject matter in painting was like tone in music. If music could have no tone, then painting could have no subject. This led him to create purely abstract pieces, using only color and line. Dr. Warsaw and Dr. Grundstad-Hall performed a piece of atonal music as some of Kandinsky’s work was shown on a slide show. Dr. Jamieson covered several other painting movements in the talk, including the rise of photography as a fine art, the introduction of Modernist styles to the U.S. by Alfred Stieglitz, the emergence of Realism in Middle America and the Harlem Renaissance in New York. Dr. Warsaw, Grundstad-Hall and Primatic ended the event with music from each time period, such as September Song by Kurt Weill. “The xylophone solo by Dr. Primatic was the highlight of the night.” Luke Larimore, a senior Liberal Arts major, said. President Bleicken attended the performance and said Moveable Feast was a “marvelous” series. English major Shay Hunter, a junior, thought the art and musical elements working together was beautiful. “Art and music are the inspiration of the world,” she said. Postmodernism replaced Modernism in the 1950s. Some scholars believe we are still in a Postmodern age. Other scholars believe we are now in Post-Postmodernism. Although labels and definitions change over time, artists in various fields continue to find new ways to reflect their era in their art.